A team of SpaceX engineers is building a prototype of the spaceship Elon Musk hopes will one day carry people and cargo deep into the solar system, and it could begin low-altitude testing next year, kicking off a multi-step test campaign before eventually going into space, then perhaps the moon or Mars. Musk said Sunday that the first version of SpaceX’s BFR spaceship could be ready to fly on “short up-and-down” tests next year, similar to the vertical takeoff and landing demonstrations conducted at the company’s Central Texas development base with testbeds before officials attempted landing full-up Falcon 9 rocket boosters. “We are building the first ship, the first Mars or interplanetary ship, right now, and I think we’ll probably be able to do short flights, short sort of up-and-down flights probably in the first half of next year,” Musk said Sunday during an appearance at the SXSW festival in Austin, Texas. Musk’s discussion of the BFR ship Sunday echoed comments he made last month shortly after the first successful test flight of SpaceX’s Falcon Heavy rocket — the world’s most powerful launcher — which would be eclipsed in thrust and lift capacity by the BFR. The billionaire entrepreneur revealed the design of the BFR — an acronym SpaceX says stands for “Big Falcon Rocket” — in a presentation at the International Astronautical Congress last year in Adelaide, Australia. The BFR design consists of a booster stage, powered by 31 methane-fueled Raptor engines producing nearly 12 million pounds of thrust, and an upper stage that doubles as an interplanetary transporter capable of carrying people, supplies, satellites, and huge propellant tanks that can be refilled in space. The two pieces of the BFR would together stand around 348 feet (106 meters) tall and measure nearly 30 feet (9 meters) in diameter, just shy of the dimensions of the Saturn 5 rocket that sent astronauts to the moon. Musk said the BFR will be able to deliver a payload of up to 330,000 pounds — 150 metric tons — to a low orbit just above Earth’s atmosphere, a figure that exceeds the maximum lift capacity of the Saturn 5, while accounting for a fuel reserve and performance penalty for landing and reuse. 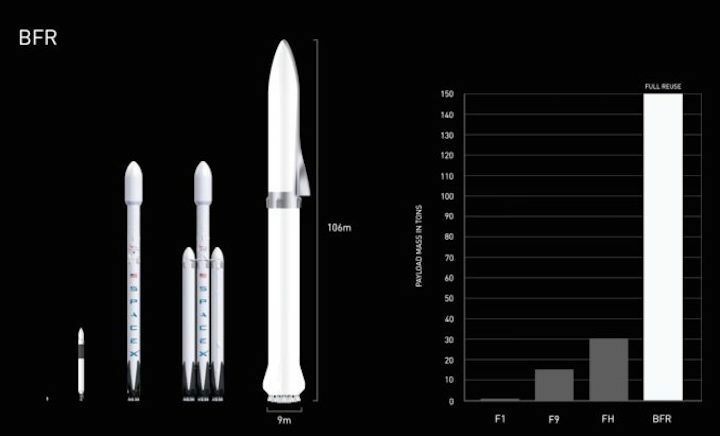 The BFR is smaller than an earlier interplanetary launcher and transporter concept unveiled by Musk in 2016. SpaceX officials have not said how closely the design of the first test spaceship — sometimes called the Big Falcon Spaceship, or BFS — will match the final layout Musk presented in September in Adelaide. The Raptor engines can be throttled from 20 percent to 100 percent power, allowing on-board engine controllers to adjust their thrust as needed during powered descents through the atmospheres of Earth or Mars. SpaceX is already hotfire testing the Raptor engine, which is expected to generate around 380,000 pounds of thrust at full throttle. Musk said last month that SpaceX will likely conduct the first phase of spaceship testing at its South Texas launch site near Brownsville. Another option could be “ship-to-ship” flights at sea, he said. Musk said last month he believes it is “conceivable” that the first launch of the BFR booster into Earth orbit could happen in three or four years. Missions into deep space would follow. Gwynne Shotwell, SpaceX’s president and chief operating officer, said Monday at the Satellite 2018 conference in Washington that orbital test flights of the company’s new vehicle could happen in 2020. He said in September that initial BFR flights to Mars could happen by 2022, with human voyages possible by 2024. Those target dates were “aspirational,” he said at the time. For example, Musk said in 2011 that the Falcon Heavy rocket — SpaceX’s biggest rocket to date — would make its first test launch in 2013. The heavy-duty rocket took off for the first time last month. SpaceX’s longtime ambition, set and steadied by Musk, has been to ferry humans to Mars to build a base, and eventually an interplanetary society. With the Trump administration’s decision to redirect NASA’s focus on returning astronauts to the moon’s surface before going to Mars, Musk has highlighted the BFR’s lunar capabilities in recent talks. The huge interplanetary ship could carry equipment and astronauts to a lunar base, Musk said, without needing to be refueled after it leaves Earth orbit. A mission to the surface of Mars and back to Earth will require a propellant depot on the red planet to generate fuel and oxidizer the ship’s return trip. In addition to interplanetary flights, the BFR could haul huge satellites into orbit, such as wide-aperture space telescopes, or deploy numerous spacecraft in one mission. 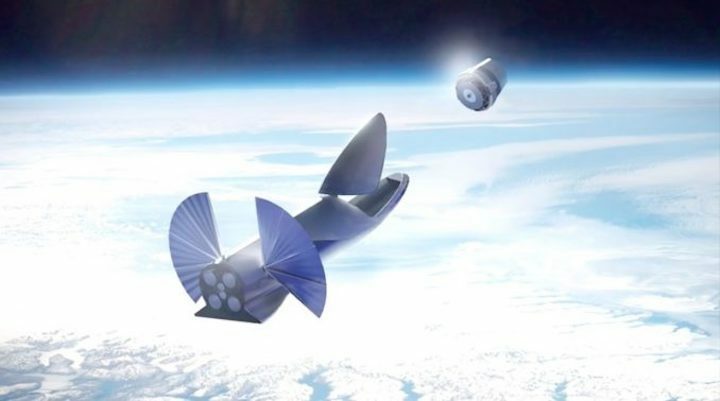 Musk said Sunday that the BFR, at least in the long-term, could cost less per flight than the Falcon 1 rocket, SpaceX’s first orbital booster. “What’s amazing about this ship, assuming that we can make full and rapid reusability work, is that we can reduce the marginal cost per flight dramatically,” Musk said. But such low costs will depend on further advancements in rocket reuse. The shortest turnaround between flights of the same Falcon 9 booster has been five months, and SpaceX is still recouping its costly investment in rocket recovery and reusability. A new version of the Falcon 9 could propel another leap forward in SpaceX’s reuse innovations. SpaceX is preparing an upgraded Falcon 9 rocket configuration called “Block 5” for a debut launch as soon as next month. Some of the changes should allow engineers to more quickly prepare the booster for another flight, and the Falcon 9’s Block 5 first stages are expected to be rated for more than two missions. Musk said SpaceX will pour more resources into the BFR after the Falcon 9 Block 5 rocket begins flying, and once the company’s Crew Dragon capsule starts ferrying NASA astronauts to the International Space Station.